Gas Management « Global Market Insights, Inc. The last half a decade has remarkably witnessed the Internet of Things penetrating the utilities domain, effectively commercializing IoT utilities market, a realm which is of late, being characterized by intense competition among tech behemoths. Having earned the tag of being one of most dynamically transformative technologies brainstormed in recent times, IoT has successfully been exploited to a massive extent in the utilities sector. The deployment of this technology has helped utility companies monitor real time power consumption by effectively promoting connectivity, operational efficacy, & communication between smart meters, edge equipment, and sensors. Furthermore, IoT has necessitated the conception of contemporary business models in the utility sector, the mass acceptance of which has been forecast to have a profound impact on the overall IoT utilities industry size, pegged at a valuation of USD 4 billion in 2016. IoT applications assist utilities in interpreting the power consumption patterns and problem recognition, facilitating the effective allocation of resources. The evolution of IoT has made it viable for smart meters to connect with consumer electrical equipment through wireless connections and provide them with real time information about power consumption. On these grounds, over the last few years, the deployment of smart meters has gained intense popularity across the utility sector. The concept of smart cities has further helped promote the application of IoT devices across the construction sector, for the reason that IoT helps upgrade building and smart energy grid connectivity, which would eventually augment the profitability landscape of IoT utilities market. Leading technocrats predict that utility firms would exploit IoT extensively in the ensuing years to reduce power consumption across the oil & gas, water, transportation, and electric sectors. For instance, the ability of the smart sensors to check the quality, pressure, temperature, and consumption of water has led to smart water management gaining renewed traction lately. 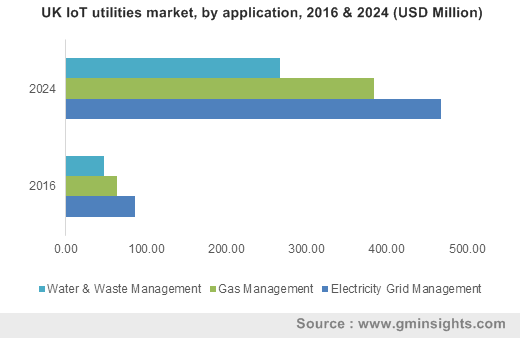 A leading industry report predicts that utility firms are forecast to reduce their expenditure by nearly USD 157 billion by 2035 through smart meter applications, thereby stimulating IoT utilities market trends in the years ahead. One of the most profitable avenues for the expansion of IoT utilities industry is the United States. Mass awareness regarding the benefits of IoT technology in sync with the presence of oil & gas production units across the country demanding the deployment of connected solutions are expected to drive U.S. IoT utilities market share. Across the APAC zone however, the escalating need for smart meters coupled with the development of smart cities & construction activities in China and India will help transform the regional IoT utilities market outlook. Furthermore, the huge presence of numerous power generating units and high government funding for the power sector will also provide a boost to the Asia Pacific IoT utilities industry trends. The competitive spectrum of IoT utilities market comprises the big shots such as Cisco Systems, Huawei Technologies Company Limited, Intel Corporation, and Honeywell International Incorporation, striving to bring about up-to-the-minute technological advancements that would have a commendable impact on the revenue of this business space. In the years to come, IoT utilities market is likely to have firmly established itself amidst the realm of IoT influenced business spheres. Aided by extensive R&D investments, IoT utilities industry will, in all probability, carve out a profitable growth path over the forthcoming seven years, with a target valuation of USD 15 billion by 2024. This entry was posted in Sustainable & Smart Technologies and tagged Application Management, Bandwidth Management, Connectivity Technology, Data Management, Device Management, Electricity Grid Management, Gas Management, Internet of Things in Utility Market, IoT in Energy Sector, IoT in Utility Market, IoT Utilities Market, IoT Utilities Market Analysis, IoT Utilities Market Size, IoT Utilities Market Trends, Network Management, Remote Monitoring, RFID, Security, Sensors, Streaming Analytics, Water & Waste Management.